“Wow. That house is small. And old … and ugly,” my friend said. We walked up the stairs and across the porch, being careful to avoid the rotting planks. The door creaked as we pushed it open. I heard rustling from deep within the bowels of the dark house. My tormentor grabbed my shirt and yanked me forward; I tripped over my feet. The chair dominated the small room. Unusual chair. But fact can be stranger than fiction. Wow, powerful and well written. Sometimes the past isn’t as bad as we remember, but sometimes it can be worse. Wow, Karen, where in the world did you find that chair! 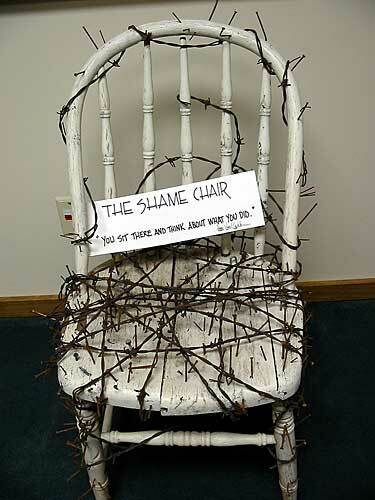 The shame chair…. Wonder where I could get one of those? I work with juvenile offenders who could (possibly) be intimidated by something like that..tee-hee. I enjoyed reading your take on this week’s prompt. Yikes! And my kids thought “time out” was bad!!!! Oh my ouchy! I hope that isn’t a chair from someone’s world! But that house just rocks for me….oh I’d love to have something like that and just get out the paint…and well probably a few nails or a new board here or…but the potential! it’s lovely! @Claudia – ha! No. He was the CFO of a finance company. Yeah … I know … go figure, lol. Very well done and unique! But I wonder about that chair, was your husband a junior high principal? oh, don’t leave us hanging…great writing. love the images. Believe it or not, that was a real chair in my husband’s office once upon a time…. Good writing! And good illustrations, too.